One month ago, Giza's antiquities inspectorate installed a new system to pump subterranean water out from under Egypt's historical Sphinx monument and the underlying bedrock. 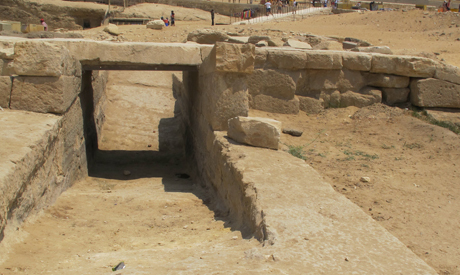 Subterranean water levels at the Giza Plateau, especially the area under the valley temples and Sphinx, have recently increased due to a new drainage system installed in the neighbouring village of Nazlet Al-Seman and the irrigation techniques used to cultivate the nearby residential area of Hadaeq Al-Ahram. The system involves 18 state-of-the-art water pumps capable of pumping 26,000 cubic metres of water daily. The project, which cost some LE22 million and is financed by USAID, has raised fears among some hydrologists and ecologists that it could erode the bedrock under the Sphinx and lead to the historic monument's collapse. Kamal Oda, professor of hydrology at Suez Canal University, told Ahram Online that, according to a report by Egypt's Ministry of State for Antiquities, the machines will pump some 9.6 million cubic metres a year of water at a depth of 100 metres beneath the Sphinx. This, he warned, could cause a drop in the ground level and increase the risk of erosion and collapse of both the Sphinx and the nearby great Pyramids of Giza. Ali El-Asfar, director of Giza Plateau antiquities, for his part, challenged Oda’s assertion. He said that the pumping machines would stop automatically when subterranean water levels reached 15.5 metres above sea level. El-Asfar told Ahram Online that the Sphinx, the Great Pyramids and the plateau's valley temples were "completely safe," since water levels underneath them had reached 4.6 metres below ground level – the same levels seen in ancient times. "Such levels are natural," said Minister of State for Antiquities Mohamed Ibrahim. He went on to point out that the Nile River had once reached the plateau, where a harbour had been dug for the boats transporting stone blocks for the as-yet-unbuilt pyramids from faraway quarries in Aswan and Tora. Egypt's Sphinx, Pyramids threatened by groundwater, hydrologists warn. I would like to say , it is not allowed to any body to make such a work beside or either around this historical area specially sphinx and The Great Pyramids. I hope they will find out another place away from this historical zone.